Digging up some of my previous projects, I want to highlight a series I painted for a Dungeons and Dragons group I used to be part of, gifting them their characters when I left. 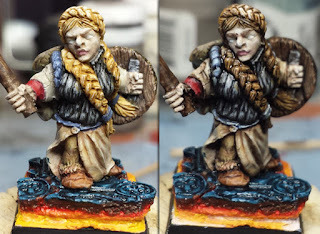 Today's post covers the miniature I painted for my wife. 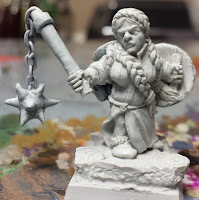 Finding a good female cleric-type warrior model. They're out there... but you've got to hunt. I removed her sword and instead covered a wire in green stuff to create the hilt of her mace. 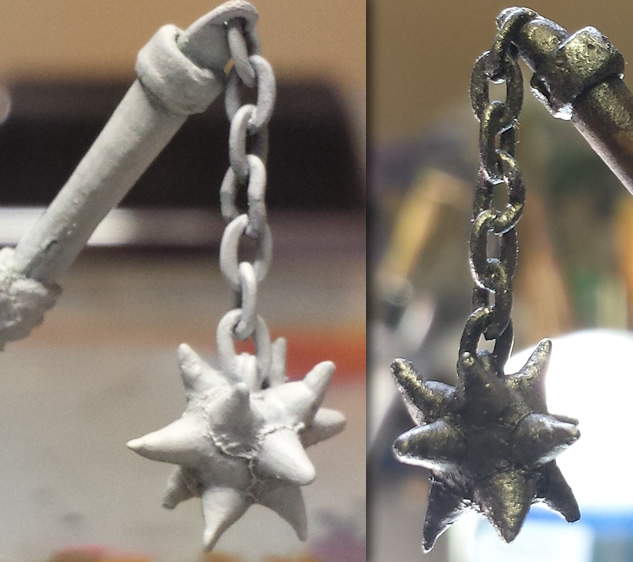 I'll have to go into further detail at a later point, but basically I used a cheap chain necklace and embedded it in the green stuff. This also creates a fun weapon that dangles and moves around as the miniature moves. I paint almost exclusively building off of a black primed base in order to get the best contrasts available to me. However, being that the setting of this world was a desert, I wanted to have lighter tones. For that, I primer her white. I always like to point out how next-level washes will take your painting. Applying some darker washes over the lighting ones I've been painting with, the washes make all the details and shadows stand out. 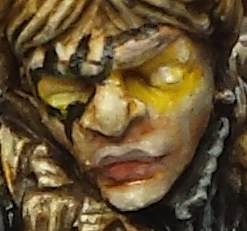 Below you can see a close up of her face. I spent a lot of time on this one. In this campaign, Dwarves wear face tattoos to show their caste. I used a fine brush to paint this around her eye and into her forehead. 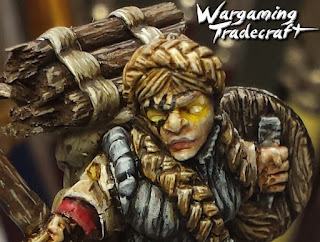 As covered in my glowing eyes tutorial, I used yellow-rimmed white eyes and yellow accents around the eyes themselves. Use the following advice so your minis don't look like clowns. Paint both lips while you paint the skin. Highlight the bottom lip only. If you want, use a darker colour on the upper lip. So the backpack she's wearing is sculpted all from green stuff. The wood piled above is actually toothpick cut to length and painted. Accessories like this add an extra touch to your miniatures and not only make them seem more alive, but quirky and believable. It looks like she's supposed to be wearing a cloth, but instead I've painted it in metallic colours. By making this different from the rest of her, I think it definitely makes it stand out as armour. Keep this in mind.. paint can fool the eyes if you want to make something appear as what it's not. 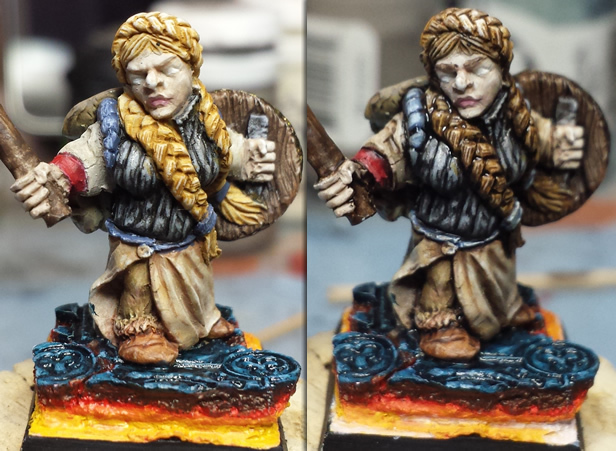 Like when painting my Pyre Troll, (but in reds) I painted some lava effects around her base as she strides confidently through throngs of enemies.